Nursery planning is so fun, but can also get very expensive very quickly! We really have repurposed most of the items in our nursery, (with the exception of our “rocker” and crib – thanks dad! )including the dresser/changing table, frames, lamp, mirror, etc. However, with Etsy being one of my favorite online shopping sites for unique items, the nursery wall art/prints seemed to be becoming my weakness. After I ordered this print for above the crib, I knew that I couldn’t order many more. They were all so cute, yet getting expensive as I was making my wish list. At around $20-$25 a piece, I wanted to find a better, more cost efficient way to decorate the nursery walls – and then I found it. Digital prints. Mostly free. Easy peasy. I came about it as I was searching Etsy one night and found this “print” (above) listed for $4.50. 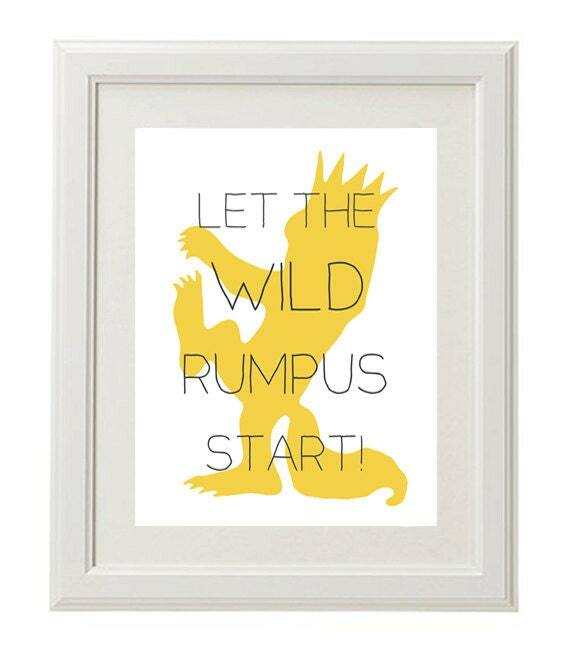 I love the book Where the Wild Things Are and knew that this had to go in the nursery…and wondered why it was so inexpensive. It just so happened that it was a digital print that would be emailed to me to print on my own printer. In essence, that meant no wait time and no shipping costs. Double score. I ordered it and fell in love with the idea of finding more digital prints. I started searching online using Pinterest and Google and ended up finding much more than just inexpensive digital prints…I found tons of free options! From kitchen prints to many, many nursery options I was hooked! Most of the websites offer the free printables, with some of them asking you to sign up to their blog and verify your email before granting you access (which only takes a second). I just save them on my computer and simply click print. It’s literally as easy as that. Check out this Christmas subway print that I printed to go in our kitchen (above). The site Simple Crafter has every season/holiday available so you can just switch out the print for each occasion – all completely free! I just backed my print with some leftover gingham fabric and love the final result! It’s so festive! Another way to create custom prints for free is by using Wordle. I heard of Wordle for the first time at a teaching conference a few summers ago and love it. You can type in any words you want and make this collage in any color, font orientation you want. They are so fun. You can really put any text you want in the box and create a custom piece of art. I did both of these in about 5 minutes. I love them – for any occasion! One of my favorite finds from MR Printables. A is not only for Alexander…also for adventure! This print looks even better in a frame that my maternal grandfather “Pop” made. It will definitely have a special place in the nursery! Have a great weekend full of fun and creating! Thanks for this post, Lane!! I can also get carried away on Etsy prints but love the idea of these free printables. Hope you and Baby A are doing well- don't you just enjoy all those kicks and punches from him? Lane Alexander 2011. Simple theme. Powered by Blogger.